Diagnostic Archives - Power Of Auto World! If your car takes more than 4 seconds to start, you may have an issue you need to deal with. If it’s extremely cold outside, this may be more of a common, weather-related issue and not much to worry about. If the weather is no different from any other day when your car has started without issue, then you should troubleshoot the problem. Even though your car runs just fine today, it could take a turn for the worse and start giving you even more trouble if the issue is left alone. Before you go inspecting the parts of your car, it’s best to start by thinking about the situation you have when your car is difficult to start. For example, is it most difficult to start your car in cold situations? Is it difficult to start it when it’s hot outside? Are there any strange sounds or smells when you start your car or are driving? Are there any warning lights such as a check engine or service engine soon light? These can all give you invaluable clues. If any of these lights are on, it wouldn’t hurt to get a free diagnostic from an auto parts store in your area. If your car is slow to start, there could be any number of things wrong with it. Troubleshooting will take some time, so prepare for that. First, determine if the problem occurs when the car is hot, cold, or at all times. This will help narrow down where you should look. Before anything else, look for signs of a leak. Ensure that all of your wiring is clean and without nicks or bites. An overly worn or chewed wire can easily cause this type of problem. The same can be said for hoses. Corroded connections can also cause a slow start. Begin by checking the wires connected to your starter. These should be two of them and they should be thoroughly looked over for damage. The connections should also be tested to ensure that they are well-maintained and corrosion-free. The started itself should also be inspected for signs of wear. Too much wear may mean you need a new starter. If your car does run fine, and there are no signs of leaks, smells, or bad wiring, this could be your issue. Next, move on to check your battery and all of its connectors and wiring. Measure the health of your battery to make sure it isn’t failing. A battery with less than 70% of its original functionality is “failing” though it may continue to work “adequately” until it falls to 50% functionality. If you want to refill your battery, the best battery tender is excellent solution. Temperature and air flow sensors can begin to give bad readings if they are allowed to become dirty over time. This is a simple thing to fix. Locating the sensors may be the most difficult part but you should be able to do so with the help of your vehicle’s manual. After inspecting your wiring and hoses for damage or leaks, consider testing your fuel pump. This is done by placing the key in the car and turning it “on” but not so that the engine turns over. Turn it off. Repeat two more times and on the third try, turn the car all the way on so that the engine turns over. If it starts in 3 seconds or less, you’ve solved the problem for now. What you have, in this case, is a weak fuel pump that needs to be replaced. In this case, adding fuel will allow the car to start “normally” again, but also reveals where your problems are most likely coming from. One of the most overlooked causes of a slow start are clogged filters. This could be the oil or air filter. These both need regular servicing or replacement. Failing to do so can make it hard for your car to do what it needs to run, hence the slow start. This is a warning sign that if these filters remain dirty or clogged, things will begin to get worse or break down. When it’s cold out, your car will start slower than it normally would. Below certain temperatures, it may not start at all even if it’s in great shape. This is because your engine oil thickens up and your battery outputs less current. Your engine will also need more fuel to get going and stay going. All of this adds up to a car that will not start quickly though isn’t in need of repair. If, however, the problem persists when temperatures are well above freezing, you have a problem. There are many, many things that could cause a slow start. The good news is that most of them are easy to troubleshoot on your own. However, if none of the above are the cause of your issue, you may need the help of a professional to find and fix the problem. That said, if your car is running fine, the problem is likely to be small or localized. Further, all of the above steps should be done annually anyway, in order to keep your vehicle in good condition. The above troubleshooting options should help you locate the issue and give you peace of mind. Having an engine that cranks but won’t actually start can be incredibly frustrating. However, there are a number of easy fixes and troubleshooting steps that may help you find and fix the problem. Also, the following steps assume that you have already checked to see if you have a faulty starter. The starter may be faulty if the engine cranks inconsistently or the started itself makes strange or grinding sounds when you attempt to start your vehicle. In extremely cold weather, if your fuel is low, it can be hard for your car to start up. This can mean that your fuel has become less liquid than usual or you just don’t have enough fuel for your car to start as a cold car require more fuel to start and run than a warm car would. If your fuel stores are very low, the weather is well below zero (including wind chill), or your car has been having trouble starting up in cold weather recently, this may be your issue. Thought it may still be wise to go ahead with the rest of your checks to make sure there isn’t another, obvious and more easily fixed issue. Newer cars have keys that communicate with them in order to start. A faulty key or key without these capabilities means that it may not start. However, in these cases, the engine will typically not crank. Do you smell burnt rubber or fuel? Is there smoke or black soot? Both of these can be signs of a leak or flooding. Make sure to clean everything you can and perform proper maintenance to correct these issues before proceeding. If your check engine or service engine soon light is on, check the codes. Even if neither light is on, your car may still output certain maintenance codes for things it knows are “wrong” but that it hasn’t realized are preventing things from working correctly. As your car won’t start and if you don’t have a digital code reading device handy, there is a way to read codes “manually” and this method is typically outlined in your vehicle’s owner’s manual or on its manufacturer’s website. After checking for error and maintenance codes and finding none, check your battery. Is it corroded? Are all of the connectors and wires intact and in good shape? If not, can you repair, clean, or replace them? Once you have done so, it wouldn’t hurt to see if that has fixed your issue. Corrosion can lead to more issues than most people would think. If no damage is found on the outside, check the function of the battery. It may not be dead, but it could be dying. Had your vehicle been slow to start before it stopped completely? If so, that is a sign that your battery has been dying for quite a while. Even if everything was fine, a battery can lose functionality quite quickly once it has reached the three-year mark and even faster after five years. You must have the best battery maintainer to recharge your battery can to start. Is Your Security System a Little Too Good? Occasionally and advanced “anti-theft” security system can prevent a car from starting. If you have recently had a small car accident, fender bender, bent your mirrors, hit your car with anything, or pressed the “panic button” your security system may have engaged and cut off the fuel supply. Wiring can be chewed overnight causing untold damage and frustration but it’s an easy thing to spot and should be inspected regularly anyway. Sensors, especially temperature sensors, can become blocked, dirty, or corroded and will need to be cleaned or replaced id the damage is too great. Hoses should also be inspected. Even a slow leak could be the culprit. Filters, both oil and air, can become blocked and prevent a vehicle from starting. They may also be installed too tightly and cause an error with another system or read as blocked even when they are new or clean. Fuses may blow out or become damaged and need to be replaced. Any fuse could be the problem, so make sure to check them all. If one fuse is damaged, be sure to check the others. There could be more than one at fault. Much like fuses, spark plugs need to be individually tested to ensure they are in working order. However, spark plugs may also be damaged or weak, rather than simply non-functional. You need special equipment in order to safely test spark plugs. Testing your fuel pump and other systems once your car refuses to start will take specialized equipment and knowledge. If you have made it this far and none of the above steps have yielded any results, you may have to seek expert help in order to proceed safely through the rest of your systems. However, you can test for signs of a dead fuel pump. In order to do this, you should be able to turn the car on, without turning the key far enough to make the engine attempt to turn over. Listen closely as you do. Do you hear the same sounds you usually do? Typically, there will be a light buzzing type sound coming from the fuel pump, briefly. That means it’s working. If there is nothing but dead silence, you may have a dead fuel pump. If your engine cranks but doesn’t start, any number of things could have gone wrong. Still, most of these fixes are relatively easy and things you may want to do as part of a regular maintenance routine. By now, you may have found your issue. If not, please get help from an experienced professional before attempting to remove or replace intricate parts. Further, if you do not have the tools to perform some of the recommended tests, do not try to do so using makeshift methods. This can be dangerous and risk your safety. Always make sure your vehicle is turned off before working on it. There are a lot of different parts that keep your car running. And it’s not always easy to tell what the problem is when it stops working. If you’re having car issues, its easy to jump to conclusions and assume the worst has happened and that your car will never run again. But instead of going into panic mode, you need to figure out what the problem is. Usually, the issue is with either your alternator or your battery. Bad alternator vs bad battery, how do you tell the difference? The alternator in your car is in charge of recycling the energy your car battery uses while driving. It not only restores the power that the battery loses, it also powers the engine management, entertainment, climate control, and other systems in your car. Your car requires a lot of power to run. And thanks to your alternator, your battery is able to be replenished while your driving, which keeps you moving forward. Think of the alternator as being responsible for cycling the power within your engine as you drive. If you didn’t have an alternator to preform this function your car battery would quickly run out of power and the engine would die. What does the battery do? Your battery is also another essential part of your car. Without it, you wouldn’t be able to start or keep your car running. The battery gives you car a jolt of electrical energy when needed to power the electrical components of your car. This is clear when you start your car, if the battery isn’t working then the car won’t start at all. Car batteries are designed to last about 3 to 5 years, so if you’ve had your car longer than that and haven’t changed the battery it may be a good idea to get your battery checked. So now you know what the alternator and the battery do in your car. They are both essential parts that help your car function. But if you’re car isn’t working how do you know which one is the cause? Well there are a few signs that will help you determine the answer to that. To tell if it’s a bad battery, first try starting the car. If it won’t start and you hear a low humming noise or clicking sound, this is a good indicator that the battery is the issue. Also, check the battery gauge, even when the car is on but the engine isn’t running the battery should still be powering the lights, windshield wipers, automatic windows, etc. Another good idea is to get a rag and wipe any corrosion off of your battery. Then try starting your car again. After you’ve done that and the car still wont start try jumping the car. After you let it run for a little while, turn the car off and try to restart it as normal. If it still doesn’t turn on, this means there is an issue with the battery because while the car was running the alternator was able to supply the battery with power. But once it was turned off the battery was no longer working again. It’s normal as batteries age that they retain less charge. After enough time, the battery wont be able to hold enough power to start the car, so it’s time to get a new one. If your battery can recharge, using the best battery tender is good way to to it. Now you know how to tell if it’s a bad battery, so how do you tell if it’s a bad alternator? If the previous steps showed that the battery was working, meaning after you jump started your car and turned it off you were able to turn it on again normally, then it’s time to check the alternator. Some signs of a bad alternator are dim lights on your dashboard, your headlights changing brightness as you accelerate and stop, a smell of burning rubber or hot wires, or a growling sound. Also, check your dashboard for a warning light that might indicate an issue with the alternator. But this may not always get trigger or may not be available on older cars. If you see any of these warning signs, it’s a good indicator that the issue is with your alternator and you need to get it checked. So, what should you do if you have a bad alternator vs bad battery? After you’ve determined where the issue is, you should take it to a mechanic to see what can be done. You will most likely have to replace the faulty part. Depending on your car, the year it was made, and other factors one issue may be more costly to repair than others. Batteries usually cost between $50-$200 depending on what kind of battery you get. Alternators are more expensive, ranging from $400-$1000 and up. So, although the symptoms of a bad battery and bad alternator may be similar, the cost to fix the problem is not. Now you know what car batteries and car alternators do. They are crucial parts of your engine that keep your car running and in good working order. And now you know how to tell the difference between a bad alternator vs bad battery. When your car isn’t running right, it’s easy to notice. However, it’s not always as easy to figure out the reason why it’s not running properly. Being able to distinguish the key warning signs of whether or not the issue is with your alternator or your battery will help you figure out what you need to do next to fix your car. A battery can be a simple, and affordable fix while an accelerator can be a little more costly. But after reading this article you should have all the knowledge you need to be able to tell if its your alternator or your battery that is the problem. And then you can work on getting it fixed from there. When you drive your vehicle should not make any weird sounds. These could be anything from clunking or scraping sounds to whining or grinding sounds. This is even true when you are turning. If you are reading this article, however, your car is probably making some sort of noise when you turn the wheel. Read on to learn all the possible reasons why your car might be making clunking sounds when you turn. Also, learn what you can do about it to prevent these sounds from happening. Depending on the speed you go when turning the wheel and noises are being made could help determine what could be wrong. If you are going fast, slow, or normal speeds when the clunking sound is made, then it could indicate what might be wrong. That is why it is important to pay attention to your speed when you start to notice grinding sounds while turning. That is also why sometimes you might hear a sound while turning and other times you might not. Just because you don’t hear a sound all the time, doesn’t mean you should have things checked out. If you hear any odd noises when turning the wheel, then there is something wrong, and you should have your vehicle looked at. If the sounds occur at slow speeds, then the problem most likely lies in the power steering system or the suspension. If the sound you hear when turning the steering wheel is a whining sound, then it is most likely the power steering pump failing. The power steering pump helps make taking turns easier. It does this by helping lubricate the steering system. If the sound you hear is coming from the engine bay or front of the car, then it is defiantly most likely the power steering pump. The power steering pump should be checked out and tested and replaced if needed. If the sounds are more of a clunking sound though when you take turns at slow speeds, then the issue is most likely the suspension. The suspension is what is responsible for helping your car handle bumps. The suspension springs get damaged overtime though from taking this pressure. They are designed to wear out though, so other more important parts of the car don’t get damaged from bumps. If the suspension is popping when turning, then it is time to get them looked at and most likely have the springs replaced. Another name for the suspension springs are the shocks. There are a variety of kinds, and they are all rated for the different amount of use, so get the best ones you can for your needs when getting them replaced. If the noise occurs during high speeds, then the main culprits are CV joints, bearings, or differentials. Depending on the type of sound that is made can help you figure out which one. The CV joint, if it is going bad, will make a clicking or crunching sound. The CV joint is where the wheels connect to the axel. A bad coupling can cause the popping sound. If the CV joint is bad, then it should be replaced. If the sound is a humming or buzzing sound though, then you should check the wheel bearings. The wheel bearings are what the wheel floats on so it can rotate without friction. While turning the wheel bearings are what carries the load of the weight of the vehicle, and that is why the sound is most noticeable when turning, especially at higher speeds. If the bearing problem is not corrected, then it can lead to uneven tire wear as well as wobbling. That is why if you suspect the bearings are bad, then you should have them replaced. Bearings are small, and it is a cheap fix and catching it early will save you money in the long run. If you turn your steering wheel at normal speeds and a sound occurs, then it could be a whole variety of different components. It could be the power steering system. This is especially true if the sound is a whining sound from the front engine area of the car. The power steering pump could be failing, or it could just be a loose belt or low fluid. Check it out first if you have a whining sound. However, just because the fix might be easy, it could also be something more series. You might have a bad tie rod. The tie rod is what connects the steering gears with the knuckles. In other words, they connect the steering rack with the steering arms. If the noise you hear is a clunking noise, then chances are one of the ends of the tie rod is bad. This is especially true if your steering seems harder. A lot of times if a tie rod goes bathe steering will be loose and mushy. That is because the tie rod helps you maintain control. A bad tie rod will make your vehicle harder to control, so it should be replaced as soon as possible. On top of the mentioned potential problems, there are also a couple of other problems that will cause your car to make noises, and the noises can happen at any speed if these parts are bad. One of the other parts that could be bad is the sway bar. The sway bar is responsible for reducing the body of the car from rolling when taking a turn. In other words, it helps keep all four wheels on the ground. If the sway bar breaks through, then it will make noises from it hitting things when turning. If the sound you hear when you turn the steering wheel is a knock or clanking sound, and you have checked other things, then you need the sway bar checked. A broken sway bar can be dangerous because you could lose control of the vehicle. The last potential bad part is possible bad ball joints. The ball joints connect the wheel hub to the rest of the suspension. Depending on the vehicle and how the weight is distributed might dictate how soon or often the car makes sounds from bad ball joints, but most of the time the sound will be a creaking sound. If you have checked other components and haven’t found the reason your car is making noise when turning the wheel, then be sure to check the ball joints. So, as you can see, there are a lot of potential reasons why your car might make noise while turning the steering wheel. Any sound while turning the wheel though means you have a problem. It could be not enough power steering fluid or a loose belt causing the power steering pump not to work or a dry suspension bushing, or it might be something worse. Your speed when the sound occurs can help you figure out the problem as well as looking at other parts of your car. For example, check the tires and see how they are wearing. If they are wearing unevenly and you have sounds while turning then the suspension may be bad, the wheel bearings may be worn out, or struts might be damaged. On top of this if you notice control issues, then the problem might be in a ball joint or more likely the sway bar or tie rods. No matter what part is worn out or damaged though you should have your car checked out whenever you notice odd noises while turning the wheel. Your car should not make noises when turning, but if it does, then now you know what you can do about it. Luckily for you after reading this you can solve the problem and fix it or why your car is making clunking sounds when turning the steering wheel. What Is The Truth About Seafoam? Engine additives and fuel additives come in a variety of different forms. They all, however, are supposed to do the same thing, and that is to clean the engine out and help it burn the fuel better. One of the most common additives out there is Seafoam. In this article we are going to look at what Seafoam is, what it does, and also learn the truth about it. Read on to learn everything you want to know about Seafoam and have all your questions answered on if you should use the stuff or not. Before going into if you should use Seafoam or the effects of Seafoam, we will first cover what it is and also what engine additives in general are. Seafoam is an engine additive that is used to clean out the engine. You can mix it into the fuel in your fuel tank, or some people put it into the oil. It is a chemical that is supposed to help break down gunk and sludge inside your engine and other parts of the car. It is also supposed to help the fuel burn better cleaner to prevent more buildup from occurring. When you add Seafoam into the engine or oil, it will cause a lot of white smoke to come out of the engine and out of your vehicle. Some people say that this is the carbon burning off of this, but others will say that this is just the Seafoam burning. So, now that you know what it is and what it does the big question is when you should use it. Depending on who you ask the answer will vary, some never say, while others say all the time. Some will give the in-between answer of if you start to have knocked. The people that say never use it say this because there is no proof that it works and a lot of them probably have experiences of the Seafoam causing more harm than good. The ones that say to use it all the time have probably had their vehicle start to run better after using it, and they are giving the Seafoam credit when there is no proof. The last group that says when there is knocking are saying this because they know there is an issue and the Seafoam might fix it and if it does, then great, but if it doesn’t then you aren’t out much. So, that brings up the question of which group is right and the answer to this is it is hard to say. There is no proof that Seafoam really helps reduce carbon in the engine and other lines, but some people swear by the stuff, and they do so because they have had good luck with. Others have had bad luck though and blame the Seafoam for clogging things like the catalytic converter or blame it for gumming up the O2 sensor. They say it causes the carbon to break off parts that it is attached too and instead of it burning off it just clogs things and attaches to something else. Again though, there is no proof indeed that it is from using the Seafoam that you had these issues and they might have been going to happen anyways. So, you may be wondering should you use Seafoam, and the answer is it depends on if the risk is worth the potential reward to you. There are a lot of different fuel additives that are supposed to help burn off carbon and remove impurities from the gas, and it really is up to you if Seafoam is the one you want to use or not. If your vehicle is already running poorly, then using Seafoam and getting lucky and having your vehicle run right again might be worth the risk of using it. However, if your vehicle runs great already, then using it and risking it having something go wrong might make you decide not to use it. A lot of people feel that fuel additives are just snake oil and don’t really work. A lot of car people think that if you use the good gas in your car and do regularly maintained like changing oil and the filters, then you don’t need fuel additives. Others think that additives help make your car run better and more consistently. There really is no right side, and you just have to form an opinion on your own based on your risk tolerance. More: If you want your car’s battery to be fully charged, highly recommend you use best battery maintainer to recharge your car battery. So, the truth about Seafoam is that it is a fuel additive. That is the only thing that is completely true. The rest is based on opinion or untestable marketing. Seafoam is supposed to remove carbon deposits, but there is no way to know if it really works or not. Some say the stuff is great while others say it will gunk up your vehicle. Some people think you don’t need any fuel additives while others think they help the vehicle run better and longer. The truth is, you have to test them yourself and see if you notice any results or not. The truth about Seafoam is you have to make your own opinion on it and find the truth yourself. Why Won’t Power Door Lock Work On Driver’s Side? Your car’s door locks are a key part of your car. While the door locks don’t affect how your car runs, it is still nice to have ones that work. That is because your door locks keep the things inside your car safe and also keeps your car as a whole safe. Sometimes though they stop working for various reasons. If they all stop working at once, then it is pretty easy to find the problem. It is generally a blown a fuse or just a dead battery in your key fob, but what I only one isn’t working. Well, in this article we will look at what it means when only the driver side power door lock won work, but the tips in here apply to your car no matter which door isn’t the one locking. How the door lock works? To understand why only one door may not be locking properly, it is important to understand how your door locks work. Both the kind that have the switch tip thing that opens and closes or the type that have the push thing that goes up and down, they both work the same way. When you press the button on your key fob to lock the door or press the button inside the car to lock the door, it sends a signal to the car to engage or disengage the locks. More specifically it sends a signal to the door lock actuator which takes this signal and turns on a motor to activate the lock. When just one door lock isn’t working it normally means that you have something wrong with this system. So, now that you know you have something wrong with this system it is time to start checking it. The first and easiest thing to check is to make sure that nothing is obstructing the door lock from engaging. If dirt or grim gets in there, then it might prevent the locking part from moving and locking. A good way to know if that is the problem is to listen when you press the locks and see if you can hear the broken door trying to engage. The best way to clear out the lock mechanism without taking it apart is to spray some lubricant into the lock. Something like WD40 will help lubricate it and break up any obstructions. This might be a simple and easy fix to your problem. After lubricating the lock if it still doesn’t work, then you will have to dig deeper into the door to try to fix it. This will mean taking the door panel off to get inside of it so you can get to the actuator and motor. Once you have the door panel off, you can see if there is any visible damage to the parts in the gearbox. Sometimes a gear from the motor can break, and this could be the cause of the problem. If you see loose pieces in the door lock area or the gear is missing teeth, then you will just need to replace it. If there is no visible damage, then you will have to go into real deep testing. The first thing that you should test is the actuator. The best way to do this is to remove the wires connected to it and then take a battery. Twelve volts is best, but a 9-volt battery is normally easier to get. With a 9-volt battery wire, a couple probes to it and then touch the probes to the input connection on the actuator. If the actuator is good, then it should try to engage the lock and make some sound. If the battery need to recharge, highly recommend you use best battery tender to recharge your car battery. If the actuator is dead, then it won’t do anything, and you have found the problem. If the actuator is bad, all you will have to do is buy a new one. A lot of times you will have to order a new one, so you might have to go a few days without your lock working and your door apart. If the actuator is good though, then you can move on to testing the other possible issue. The other possible issue is a dead motor. At this point that is the only thing left to check. You can check it in the same way as the actuator. Connect some wires to a 9-volt battery and then connect the probes to the motor. f the motor isn’t bad and none of the other things are bad, then you have or had a problem with how the lock was put together. Reassemble the lock, and it might work again. The problem might have been a bad connection that you just didn’t notice. Why only one lock go bad? You may be wondering why only one motor or actuator failed though if you lock all your doors the same amount of times. Well, since these parts are moving, they happen to fail at different rates. This is especially true for the plastic pieces like the gears because even though they are the same, they all had different variables in their production. That is why one lock may break and none of the others even with equal use. So, now you know why only your driver side door isn’t working. You know that locks are made up of gearboxes, motors, and actuators and any one of these parts can break at any time within a single door. Now you know what to look for though if you only have one lock that isn’t working. You know to start with lubricating the lock and see if that fixes it before taking it apart. If you have to take it apart though you now know to look for broken gears in the gearbox and how to test the motor and actuator to see which one might be bad. You then know how to replace it, so the next time your driver side lock isn’t working, or one of your other locks isn’t working you will be able to troubleshoot it and fix it yourself. Temperature Gauge High But Car Not Overheating: Why And What To Do? Your car has a handful of gauges on the dash, and it is important that they all work right because they tell you the key things about your car. Some of these gauges it is pretty easy to understand why they are important such as the fuel gauge because you need to know how much gas you have so you don’t run out, but others can be a little harder to understand why they matter such as the RPM gauge or engine temperature gauge. Well, in this article we will help explain and break down the temperature gauge and what it means when it is reading high, but the car isn’t overheating. More: Overcharging is bad on your battery. A battery tender is smart and will not overcharge the battery. So that is why best battery tenders are the way to go if you are going to keep the battery on a charger for a long term. So, before going into why your temperature gauge might be reading hot, we will first briefly cover why it is important. The temperature gauge is responsible for monitoring how hot your engine is and let you know. Normally your temperature gauge should read around the middle, and this is normal. It means your engine isn’t too hot or too cold. Yes, issues can happen with your engine if it is too cold as well as if it gets too hot. If your engine gets too hot though, then that is when real damage can happen because the seals can break or the head can crake from the engine overheating. That is why it is a good idea to pull over and stop if the engine temperature gauge is reading hot because this means that the engine is too hot, or does it. Well, most of the time the temperature gauge works correctly, and when it is reading high the engine is overheating, but sometimes the gauge messes up. Read on to find out what else could be wrong if the gauge is reading high, but the engine is not overheating. 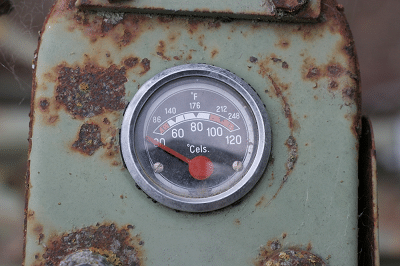 There are a handful of common reasons why your temperature gauge might be reading high. There are more reasons for a high reading, but they will normally cause your engine, and this article is only focusing on reasons why you might be getting a false reading. The most common reason for your temperature gauge to read hot is that the engine really is overheating. This can happen for a variety of reasons, but the most common is low coolant or air in the system. If your gauge is reading hot, then make sure your engine really isn’t overheating and make sure you have coolant. Also, if you have just had your coolant changed or flushed, then make sure air didn’t get in the system. If you have checked these things and really think that your engine isn’t overheating, then you can move on to some of the other causes of a temperature gauge reading hot, but it is important to take the reading serious first to prevent damage to your engine before you just think it is a false reading. The next thing that might cause your engine to read as though it is overheating when it isn’t is a broken temperature gauge. The temperature gauge is made up of moving parts, and anything with moving parts can sometimes break. There are a few possible ways that the temperature gauge might be broken. The first is if you did overheat your engine and the needle somehow got stuck in the hot section. Over time gunk might get into where the needle is, and this could up cause the needle to get stuck. If it had never moved to the hot part before and they did, then it might have got in to build up causing it to get stuck there after overheating for real. Another way that the temperature gauge may be broken is that one of the stepper gears in the gauge may be broken. The gauge has different gears inside of it that are responsible for moving the needle. Over time these gears can wear and if one breaks then the needle may move incorrectly. One of these two issues could possibly be occurring leading to a broken temperature gauge that is giving a false high reading. Another reason why the temperature gauge might be giving a high reading when the engine isn’t overheating is that the temperature sensor may have failed or been failing. The temperature sensor is responsible for measuring the temperature of the engine at any given time. If the sensor has died, then it may not be sending out reading, and the car could respond with giving a false high-temperature gauge. Also, if the sensor is dead, it may give off a random reading instead of an accurate one. A false reading might also happen if the sensor is damaged or dying. The sensor could easily get damaged while driving if something hit it or it got debris on it. Also, if the wires are damaged or it has a short, then this could cause a false reading. Cleaning and checking your temperature sensor is a good idea if you get a false high-temperature gauge reading. What to do When Temperature Gauge High But Car Not Overheating? If your engine is not overheating, but you have been getting a high-temperature gauge reading, then what should you do. Well, we have already mentioned that you should check your temperature sensor. Make sure that it is clean and working right. Also, check any of the fuses that go along with it to make sure they aren’t messed up. If the temperature sensor is working right, then the next thing will be to check the mechanical parts of the temperature gauge. Make sure that the needle inside the temperature gauge isn’t getting stuck and that all the gears and moving parts are clean. Also, when checking to make sure they are clean also make sure that they are not broken. If these two things are fine, then you really should start looking at reasons for an overheating engine because chance is your engine really was overheating. So, now you know why your temperature gauge might be reading high even when the engine isn’t overheating. You know the most common reason for an overheating engine is lack of coolant, but you also now know that sometimes the temperature gauge might give false readings. These false readings normally come from the gauge being broken due to parts becoming wore and broke or from the needle getting stuck. You also know that false readings can also be caused by a failed temperature sensor. If you are getting high readings without an overheating engine, then be sure to check the temperature sensor and mechanical part of the temperature gauge. If those things aren’t the problem though, then your engine might have really been overheating, and you need to get it checked out to prevent major damage to your vehicle.